According to news report’s, today Google will make its first big announcements regarding first set of Android One smartphones for India customers through YouTube and Newsstand. 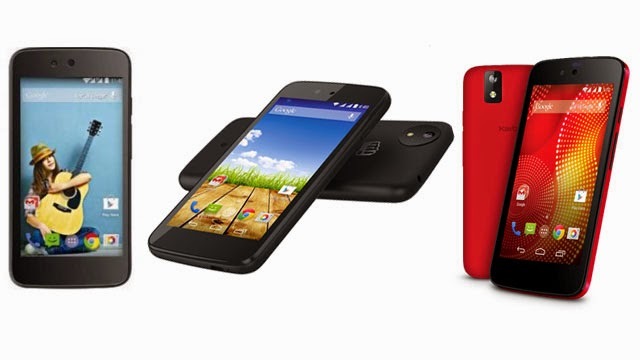 Now Google is all set to launch its first Android One initiative in India today. It’s expected Google will unveil some important news on the Newsstand and YouTube. Recently only Google has partnered domestic smartphone vendors like Micromax, Karbonn and Spice to launch the affordable smartphone to the Indian customers. Today morning only, tech giant Google has released 3 handsets under the Android One program with the collaboration Flipkart, Snapdeal and Amazon - will each get an exclusive smartphone to offer consumers. Snapdeal listed the Karbonn Sparkle V, Flipkart will offer the Spice Dream Uno and Amazon India will exclusively offer the Micromax Canvas A1. Today was a great day for Google as today it has announced "Android One". A new design platform which will help to manufacture and to build very low end smartphone easily. This new move will help to build low cost smartphones segment based on Android mobile operating system. In the recent Google's annual developer conference Google I/O, Sundar Pichai, the head of Android and Chrome platforms, lunched this new platform. By which Android manufacturers and telecom carriers can build their own apps over it. Through this free custom apps can be added by any developer or programmer in Samsung, HTC, LG and Sony etc do. Sundar Pichai, a main head of Android and Chrome platforms: said the new platform will be helpful for manufacturers and telecom company to build their own apps over it. The main benefit is that now manufacturers can add a few custom apps without diluting the Android experience like Samsung, HTC, LG and Sony etc do. In the event Pichai, launched Micromax's Android One smartphone, which is having 4.5 inch screen, dual sim functionality, microSD card support and FM radio under $100. Google is also hoping to try it out with Karbonn and Spice. Pichai, said as Android is used by billion users and it’s expected that Android One will help to increase its users to five billion. The statistics shows that only 10% India customers are using smartphone. 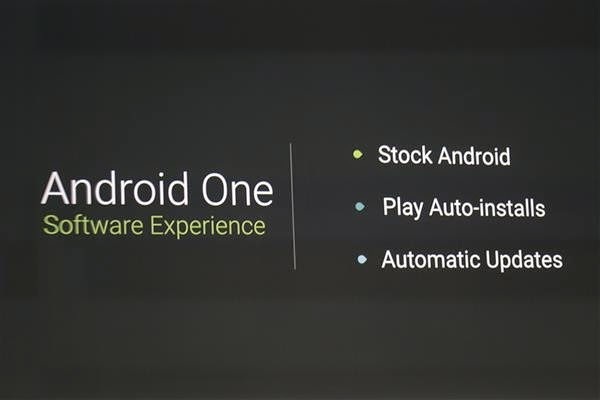 To attract more customers for Android-based smartphones, Google had launched Android One. After a month’s wait today Samsung had launched it’s new flagship smartphone, the Galaxy S5, in the Indian market at a price of Rs 51,500. 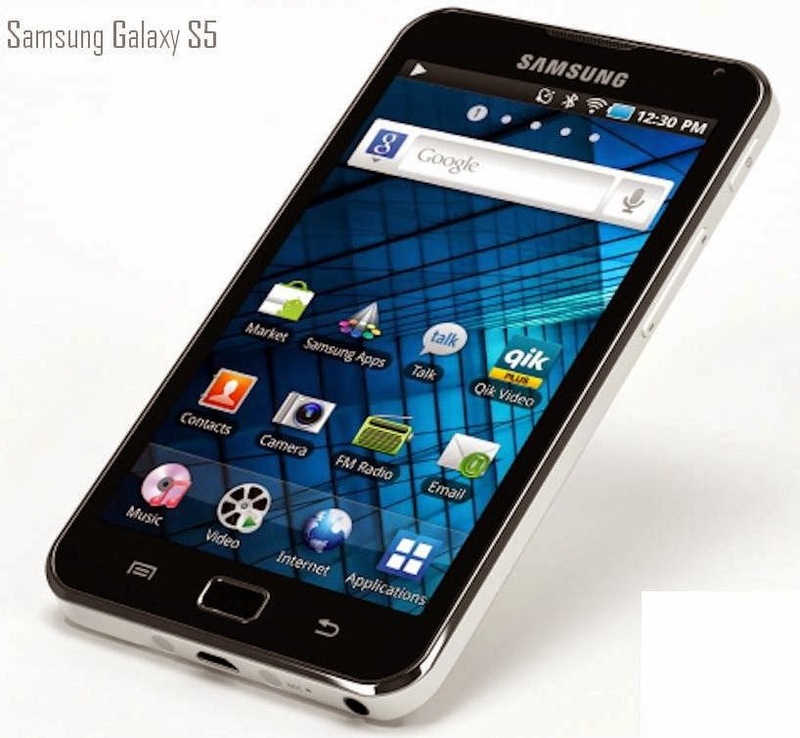 In the launching event last month, Samsung had announced that phone would be costing between Rs 51,000 and Rs 53,000. Recently, Samsung spokesperson confirmed the price in the media. Now the new Samsung Galaxy S5 will be available to Indian consumers starting April 11. Most anxious moments are over for Indian customers, as the mobile giant, Samsung company had launched flagship smartphone Galaxy S5 at a glitzy event in New Delhi. In the even the company has announced that the new Galaxy S5 can be pre-booked starting from today but at some selected authorized shops and on the company's official eStore for ?1,500. At the same time, the company has not announced the final price of the device, but it’s expected that the price rage will be between from 51,000 to 53,000, some media reports said. After Galaxy S5’s success full announcement made on MWC 2014, today Samsung has officially sent out invites for the lunching event of on Galaxy S5 in India on Thursday. Now Samsung is all set to lunch it’s most awaiting Galaxy S5 in India on 27 March. As of now, there is no word whether the Samsung Gear 2, Gear Neo and Gear Fit will also be launched in India on the same day. 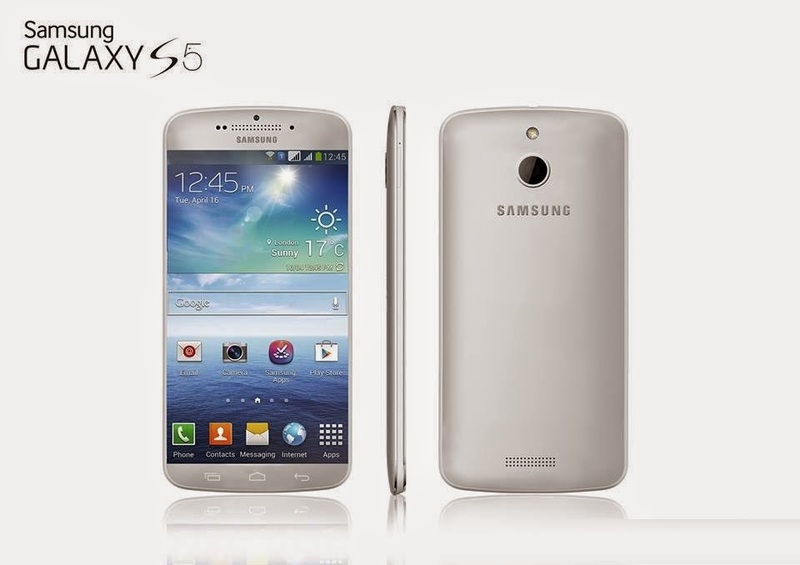 After lots of rumors moving around, on Monday finally Samsung announced its latest flagship phone called as Samsung Galaxy S5. It’s the latest phone by the company with many news features added like finger-print scanner or the waterproof body. In the event, company’s executives said that the company wanted to enhance core features that improve everyday use, like photo-taking, battery life, download speeds and protection against water and dust. 1) Samsung Galaxy S5 is having 5.1-inch full HD screen with the same Super AMOLED panel. 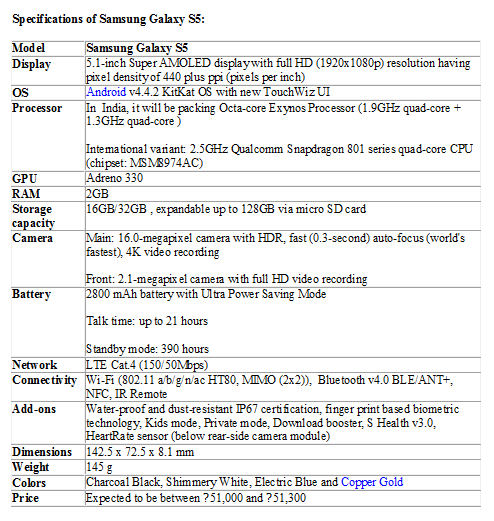 2) The Galaxy S5 has a 16MP camera on the rear with a heart-rate monitor just below it and 2MP front camera. Also features such as improved HDR and selective focus mode. 3) New feature added in home button, as home button also functions as a finger-print reader. 4) Samsung Galaxy S5 comes with fifth generation 802.11ac WiFi and it uses LTE Category 4 standard. A very new feature called Download Booster allows you to bond the WiFi and LTE connections simultaneously to improve download speeds. 5) The new Samsung Galaxy S5 comes in the 16GB and 32GB variant with microSD slot for adding in a microSD card upto 64GB. It packs in a 2800mAh batter which gives talk time of 21 hrs. 6) A very new feature called Ultra Power Saving mode, which claims to give you a 24-hour battery even when your phone shows the battery capacity at 10 per cent. 7) The Galaxy S5 is IP67 dust and water resistant. Most special feature of Galaxy S5 is the Finger scanner which protects locked phones and is used to make mobile payments. Able to captures ultra-HD video. In the even the price of the device was not yet released but we will try to search it and update it soon. 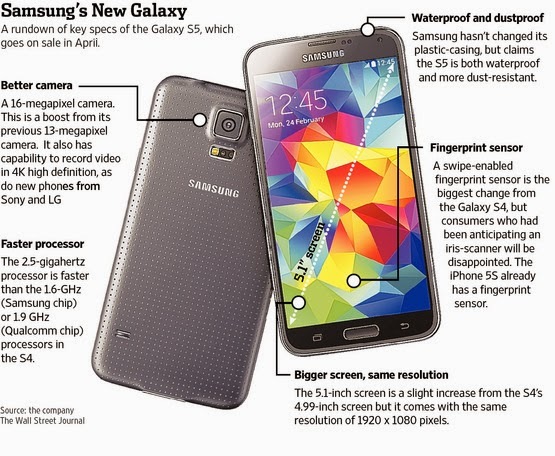 The Samsung Galaxy S5 will hit the markets on April 11th.